Small pastel hearts dot this style here and there like kisses placed perfectly. 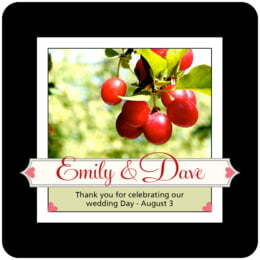 A bold border, room for a photo, and a 50's style script typeface makes this design pure happiness and joy! Room for your supporting text below the photo. In your choice of almost 20 colors, there is plenty of room for self expression here. 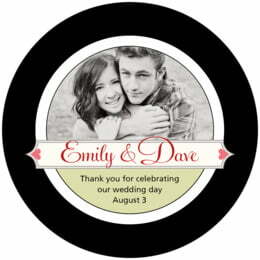 Customize your Cherish Hearts beer coasters for your party, friends, or small business enterprise today! Cherish Hearts beer coasters are available in multiple shapes—3.9" round, 3.9" square with rounded corners, and others. They are die cut, so their top edge is softly curved down. These coasters are designed to be used as they are disposable and not meant to be able to keep forever. However, if you want to keep them for mementoes, keep them in their package, or just don't use them. You can let them lay out as long as they don't get wet; they will remain in great shape. Our Cherish Hearts beer coasters are printed on one side only, and the Evermine logo is debossed into the blank white pulpboard backing. Start personalizing your Evermine Cherish Hearts beer coasters today!